It may be 25 years since the original RoboCop was released, but it appears that half man, half robot super cop is still a Ford fan. Automotive news site Jalopnik has just posted spy shots of the new Ford Taurus Police Interceptor taken on set in Toronto. The new Taurus is black and white, unlike its predecessor, which was all black. The original RoboCop featured a 1986 Ford Taurus LX that had a 3.0-liter V6 engine and 4-speed automatic overdrive transmission. The movie-version Taurus touted a lighted pushbar, onboard computer and high tech dashboard. The vehicle is currently on display at the Branson Auto Museam in Branson, Missouri. RoboCop was originally supposed to drive a vehicle similar to the Batmobile, but the idea was later nixed after director Paul Verhoeven found the “Robo-mobile” prototype too outlandish. Verhoeven later settled on the Taurus, which did not make the Ford Motor Company very happy. The automaker refused to sponsor the vehicle, leaving the film to purchase all the cars featured in the movie. There is no word yet on whether the RoboCop reboot will update the 1977 Oldsmobile Cutlass depicted in the original film. The heavily modified Cutlass, known in the movie as the 6000 SUX, was actually supposed to be a parody of the Pontiac 6000. Commercials within the film touted the 6000 SUX as an “American tradition,” which got 8.2 MPG. Aside from the two aforementioned vehicles, 1987’s RoboCop also showcased the Merkur XR4Ti. The short-lived hatchback was briefly featured as an executive vehicle when RoboCop is brought to the precinct. Set in Detroit 2028, the forthcoming remake centers on a fatally wounded police officer named Alex Murphy who is saved after multinational conglomerate OmniCorp steps in with their lifesaving robotic technology. Swedish actor Joel Kinnaman (Safe House, The Killing) assumes the title role this time around, taking over for Peter Weller. The star-studded cast also includes Gary Oldman, Samuel L. Jackson, Abbie Cornish, Jay Baruchel and Michael Keaton. Talks of a RoboCop remake first arose in 2005 when Sony Pictures made an unofficial announcement. The projected was halted just a year later before picking up steam in 2008 when MGM hinted at a possible franchise. Pre-production for the film finally started in 2011, with actual filming beginning on September 24, 2012. Although the majority of the filming is set to take place in Canada, MGM has confirmed that it will be partially shot in Detroit. 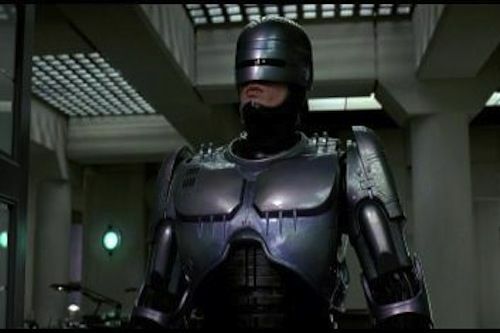 Although originally slated for a 2013 release, the RoboCop remake will now be released on February 7, 2014.